When Mel Jordan (Caleb Asch) turns up dead in the submerged car he just won on Bob Kenny (Peter Marshall)’s TV gameshow it seems like the pressure of playing for $1m might have been too much for him. Something doesn’t add up though and Hammer decides further investigation is warranted. Assisted by Doreau, he pressures Kenny and takes part in the show, putting his own life on the line. Bob’s obsequious assistant David (Ken Lerner) and, to a lesser extent, his on-screen sidekick Inga (Suzanne von Schaak) contribute to the mayhem, while there are appearances from Arlene Banas as Mel Jordan’s widow and Cindy Roberts as her neighbour Mrs Perlin. Toni Attell makes a brief appearance as Officer Grace. The episode was directed by Daniel Attias, the first of his two Sledge episodes. The writers were Mert Rich and Brian Pollack, the third of their ten collaborations for the show. 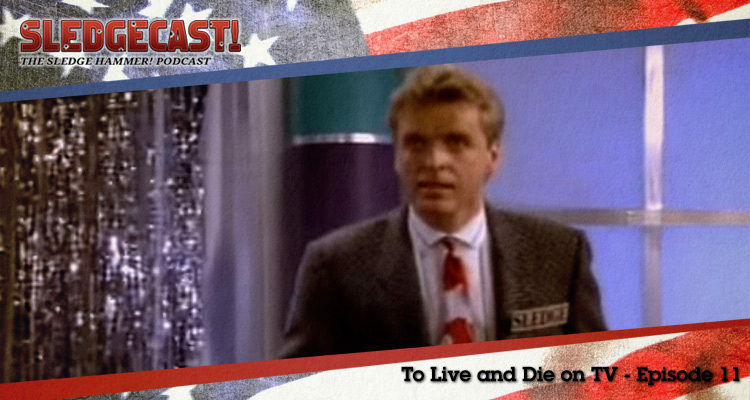 If you have thoughts on any aspect of To Live and Die on TV, please share them below, or find us on Twitter at @sledgecast. To Live and Die on TV was released in 1986. It is 30 minutes long and originally aired on the ABC network. This episode is available on the Sledge Hammer DVD box set from Laser Paradise (German/English language) in Region 2 and from Image Entertainment in Region 1 (USA).